The decision was made before CAO parent company STG announced it was merging it’s handmade cigar operations with Swedish Match, parent company of General Cigars which makes Macanudo, Punch, La Gloria Cubana, and a number of other top-selling lines. According to Toraño, the only impact the merger had was on the date of the new distribution arrangement. Instead of waiting until January 1, 2011, the date was moved up to August 1—in time for the 2010 industry trade show in New Orleans, where Toraño will have its own booth. The new arrangement coincides with a new logo designed to put the focus back on the Toraño family. Charlie describes the new logo as “contemporary but classic.” The new branding, “inspired by past but motivated by out future,” de-emphasizes Carlos Toraño (though Charlie says his father will continue to play a pivotal roll) and places the spotlight on the entire Toraño family. Toraño is using that control to take a new direction with new blends. “Moving forward we are working with other small boutique factories,” Toraño tells me. Current lines will continue unchanged, still being made in STG’s factories, which were purchased from the Toraño and Fidel Olivas families in 2009. 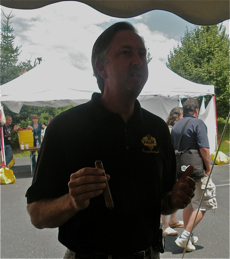 Reflecting its new focus, Toraño Family Cigars will be bringing three new cigars to market this year. Two premium lines will be sold at retailers only, while a third line, Brigade, features an Ecuadorian wrapper and will sell in bundles of 16 for around $2.50 per stick. The company’s first new premium stick, The Master, is a joint effort by Charlie Toraño and longtime master roller Felipe Sosa. Made at American Caribbean Cigars in Estelí, Nicaragua, it is an all-Nicaraguan cigar described by Toraño as medium- to full-bodied. It will sell for $5.50-5.95 per cigar. A second new cigar, also to be sold only in brick-and-mortar stores, is the Single Region. It features Jalapa Nicaraguan tobacco all from one farm (although from different years). It is being rolled at the Fabrica de Tabacos Raices Cubanas factory in Honduras, which also makes such highly-regarded smokes as the Illusione, Epernay, Cruzado, Alec Bradley Tempus, and Padilla 1932. A “fuller-bodied” smoke, the Toraño Single Region will cost between $6.50 and $6.95. In addition to the three blends set to debut at this year’s trade show, Toraño is already working on new blends for the future, including another Single Region. That Single Region smoke sounds delicious. All-Jalapa tobacco and made by the Raices Cubanas factory! This is the sort of first-rate journalism that sets Stogie Guys apart. While other sites were content to merely copy and paste Toraño's press release, you guys actually landed a meaningful conversation with Charlie. Kudos and thanks! Excited to try the new Toraño blends, by the way. If Charlie was keen to maintaining control of his outfit he must have some good product to back it up. I really only like the 50 year exodus, and the 2008 Tribute from Torano. Looking forward to smoking their new releases for sure! So I'm reading that Torano will be releasing two new Nicaraguan puros at the show? Yum! Look forward to trying them, especially the Single Estate.